One $4.8 Million Dollar Listing. Realtor Andrew Pikoff uses Happy Grasshopper to stay top-of-mind, earn more referrals, and pull in gigantic returns. How many sales are hiding in your database? Like most salespeople and small business owners, Andrew needed a reliable way to engage the people in his database. Between responding to new leads, nurturing past clients, and somehow finding time to handle current business, Andrew was searching for an email marketing solution that was highly automated, yet "perfectly him." He found that, and more, in Happy Grasshopper. Like more than 10,000 other sales professionals, his journey started by scheduling a free consultation, during which our team was able to learn about his unique needs. ​I cannot say enough nice things about the Happy Grasshopper team. They’ve been incredibly responsive and helpful with getting my account set up, exporting & tagging data to my Follow Up Boss database, and launching my campaigns." Writing your own copy takes time away from following up on leads and making sales. Putting this task in the hands of a professional meant more free time so Andrew could focus on his business. "My copywriter is an amazing writer," Andrew says. "After our initial phone interviews, she is me! She sounds like me, she thinks like me, and she expresses my desired thoughts just like me." The "magic" is the nurturing portion of the campaign. Every few weeks, Andrew's prospects receive fun and friendly messages about things that keep The Pikoff Team top of mind. "We've had a great response rate from past clients, sphere, and new leads to the various reconnect and nurture campaigns," says Andrew. The custom nurturing messages "focused on my dogs and various other things that make me and [my team] unique." Hiring Happy Grasshopper paid off for Andrew in a big way. Shortly after launching, he got a reply to one of his email messages that led to a $4.8 million dollar listing. If you'd like to see if Happy Grasshopper can work for you, please schedule a free consultation with us here. Our writers create timely, interesting messages that start conversations. Unlike other services, no single recipient ever gets the same message twice. Stop struggling with what to say! We prompt you when it's time to pick a new message for your past clients and sphere of influence. You can edit if you like or add a PS line. 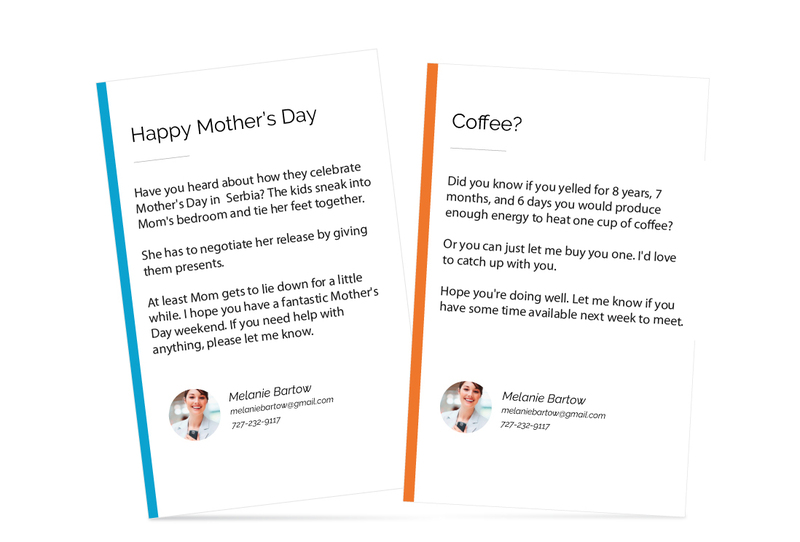 From your very first send, you'll get positive replies that lead to more referrals and sales. All replies go directly to your regular email inbox. We do the hard stuff. You enjoy better relationships and more sales. Happy Grasshopper imports, organizes and de-duplicates contacts from wherever you keep them. Our software makes it easy, and you'll be ready to send in ten minutes or less. Since 2010, we've delivered hundreds of millions of messages, which means that we have a MASSIVE pile of data. With HG, you can always be confident that the messages we've curated for you will generate positive replies. Happy Grasshopper has you covered! Our combined membership earns over $1 billion dollars per year in commission. How many sales are hiding in your database? Many of our members find transactions from their very first message. Our members report positive replies, and even sales, from their very first send. Getting started takes less than ten minutes. Our software is simple and intuitive. No matter how comfortable you are on the computer, you'll be surprised at how easy it is to have success with Happy Grasshopper. We have a dedicated support and development team here to help when you need it. For advanced users, we even have an API that connects us with hundreds of other services. ​We believe in earning your business one month at a time. This means you can start and stop with us whenever you choose, and we even have a 100% Happiness Guarantee. Fresh, relevant content for all the people you need to keep in touch with, including content for email and the social media platforms of your choice. All refreshed 26 times per year. People who know you don't want to feel "marketed to." That's why we write and deliver messages that look and feel like personal communication. We recommend 17 sends per year. Copy and paste our social media content into the platforms of your choice. We recommend a minimum of 5 posts per week. There's PLENTY of content to choose from! Past clients should be your largest source of referrals but, of course, that's dependent on your ability to stay in touch! We recommend 17 sends per year. Do you have a new listing that you're ready to share with the world? Just grab one of our templates and share it. Send it to leads and other agents as needed. Spread the word about your open house to leads and other agents. Just choose a template and add details like the date, time, and location. Happy Grasshopper makes getting a beautiful email signature as easy as filling out a form. Your options are limited only by your imagination. Once you're using Happy Grasshopper, you can write and send a message anytime you choose. This is a great feature that means you won't need another service! With Happy Grasshopper, everything is easy, automated, and an unbelievable value, too. You can start and stop your membership at any time. Happy Grasshopper is a monthly service that renews automatically for as long as you'd like. Most members stay for more than 4 years! Once you're using Happy Grasshopper, keeping in touch is effortless. In just a few minutes per month, you'll be finding new opportunities! Can Happy Grasshopper help you? to start more conversations and earn more sales. We've built Happy Grasshopper to be as awesome and useful as possible. And to get you results. If we fall short of this goal in any way, you can get your money back within 30 days. Simply contact our friendly support staff and we'll send you a refund, no questions asked. About every three weeks for your keep-in-touch messages. Our studies show that a 3-week send cycle increases engagement and decreases opt-out. Happy Grasshopper has an average open rate of 38.6%, which is almost double the traditional open rates reported by other email marketers. Yes, your personal and client information is stored on our secure servers and we will never share or sell your information with anyone. Your credit card will be processed and stored at Stripe.com. Happy Grasshopper is a month to month service. If you are unhappy with our services at anytime, simply cancel your membership and you will no longer be billed. We also offer a 30-day Money Back "Total Happiness" Guarantee.